Oh my, the dreaded socks! 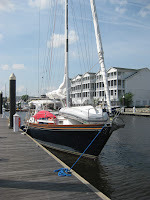 After the Alligator River, we had a good sail to Coinjock Marina. 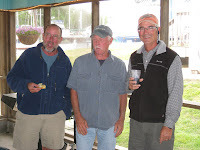 We had a good meal at their restaurant shared with other sail boaters, one of which was Simple Pleasure whom we met at River Dunes. The next day there were thunderstorms predicted between 11am –noon. We left before 7am to try to be through the wide part of Curratuck Sound when they hit. We were glad we did, because they came an hour earlier and we were in the Northlanding River which was much narrower when the 39 knot winds came through and the temperature dropped at least fifteen degrees. Long pants and socks were donned for the cold temperatures which were the first time since the cold spell in Miami in December that the socks were used. Luckily we had pulled in our sails before the winds hit, but Simple Pleasure did not and the sun protective covering on their jib was shredded. We were lucky that there were two spots left on the bulk head at Great Bridge which is where we spent the night after sharing a meal on Blue Heaven. We caught the 8am lock opening and headed to Norfolk. The winds were strong out of the northwest which would have been miserable out in the bay to head north, so we decided to take a slip at Waterside Marina. 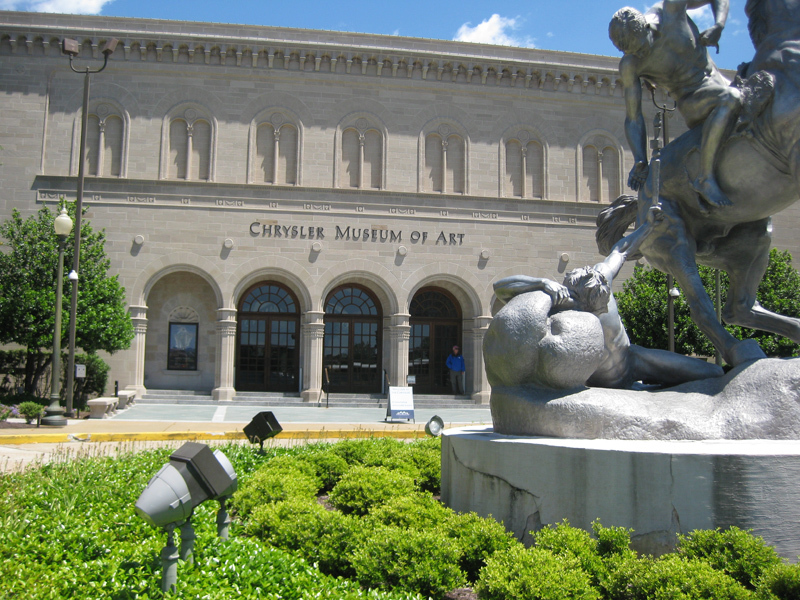 After lunch Al and I walked across town to the Chrysler Museum of Art. 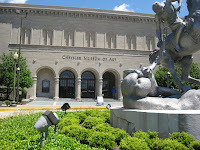 It was a beautiful building with two great special exhibits that were there. One was an artist named James Tissot who had done over 350 paintings of Christ’s life. They were so detailed and none were over a foot in size. The other exhibit I found interesting was the Tiffany glass exhibit. It consisted mostly of the various lamps that had been made. They were just exquisite! 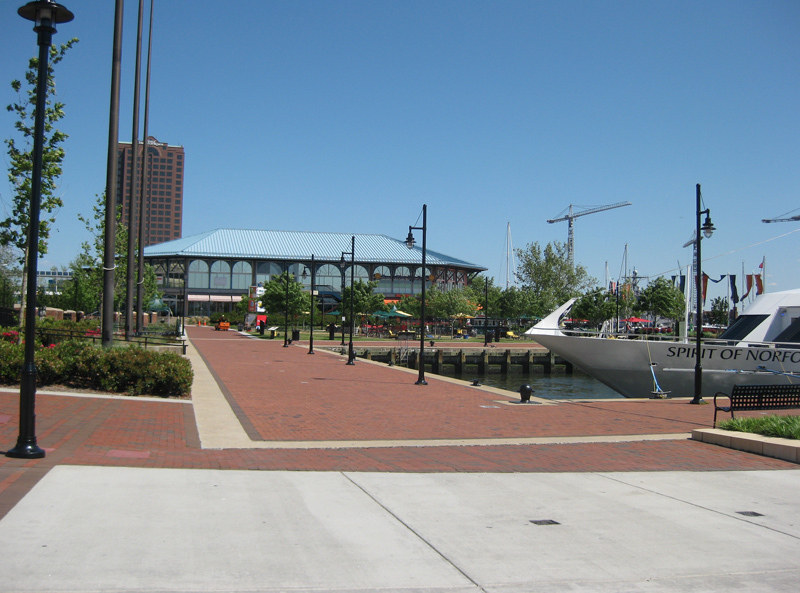 The waterfront at Norfolk is a delight to walk around. They were havjng a Cinco de Mayo party at the waterfront, but we chose to eat dinner at the Ganby Bistro which was an excellent deli with Bill and Sharon on Simple Pleasure. 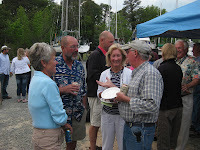 We had great southwest winds to leave Norfolk and come up the bay to Deltaville. 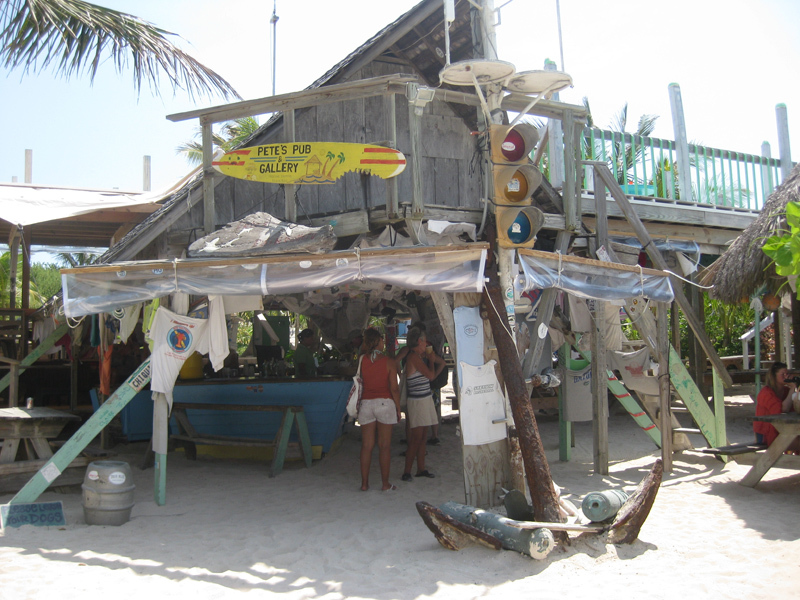 This was where our friends on Discovery and Tilt leave their boat for the summer while they head back to Michigan. Simple Pleasure was doing the same thing so we decided to stop here for two days to visit with them. We anchored off Deltaville Marina in Jackson Creek. We lucked out because that night they were having a wine and cheese reception for the people in the marina and for those who worked on the buy boat that was restored at the Deltaville Maritime Museum. 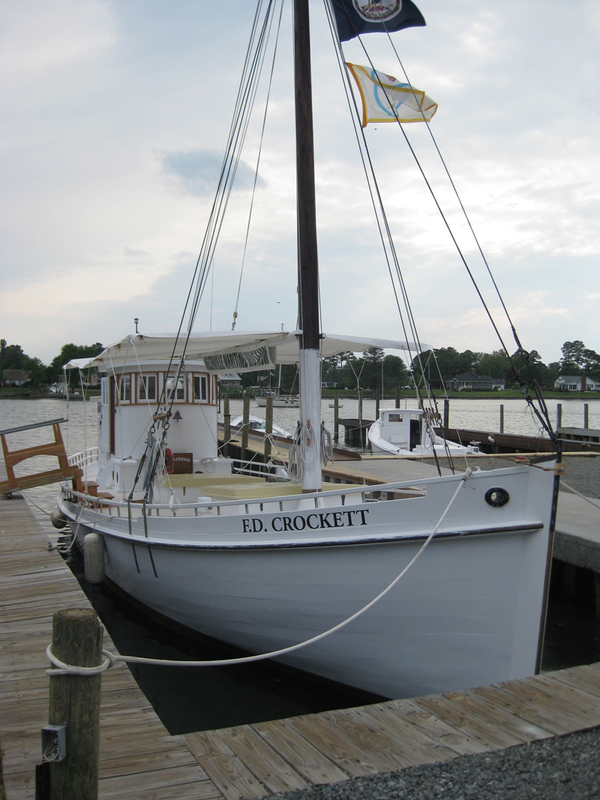 Bill and Sharon asked if they could bring friends and they said yes, so we had a nice time learning about the F. D. Crockett as well as connecting with friends. 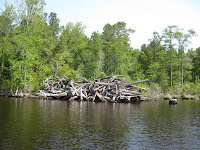 I never knew what a buy boat was and learned it would go out to the skip jacks doing the oyster harvesting and bring the oysters to the various markets. So in other words, it was the middleman for oysters. Since our friends were busy working on their boats preparing for storage on land, Al and I entertained ourselves by walking to the Deltaville Maritime Museum which we had been to in the fall. I thoroughly enjoyed their sculpture garden in the woods so we went back to experience it again as well as to get some exercise. 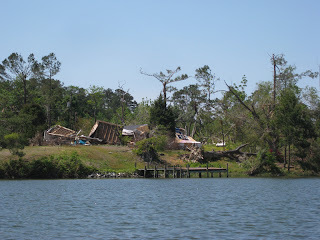 We then took the dinghy to the next creek over and found some tornado damaged trees and houses. This tornado had gone through about 3 weeks ago. It was only a half a mile from the marina. The homes and marinas nearby were so lucky. It did quite a bit of damage in Deltaville but luckily no one died. 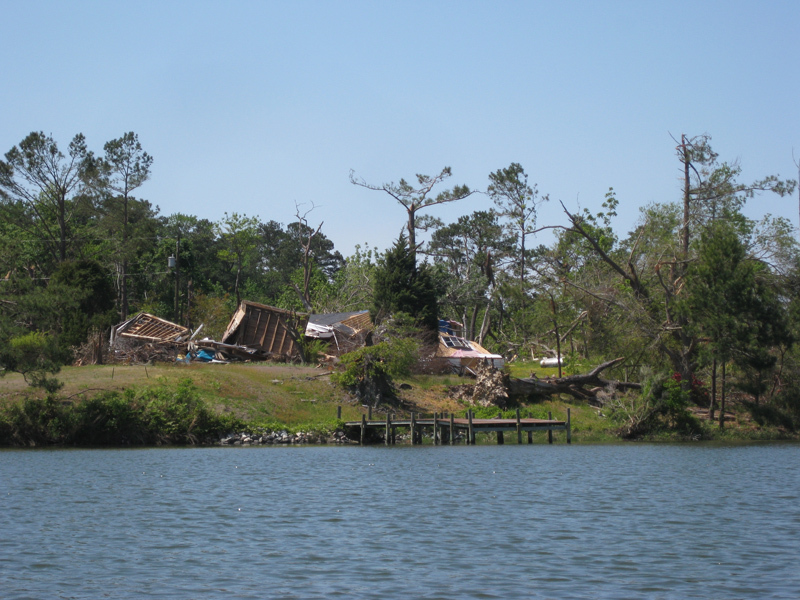 Home near marina demolished by tornado. That evening we had dinner with Carl, Marilyn, Craig, Chris, Bill and Sharon. We each brought something for a delicious spaghetti dinner in the screened in porch at the marina. We said our goodbyes saying we see them in two years, but they said on no, we got to come next winter. We said that we’ll see once we get home whether or not that is a possibility. We truly have enjoyed our experience but only time will tell. 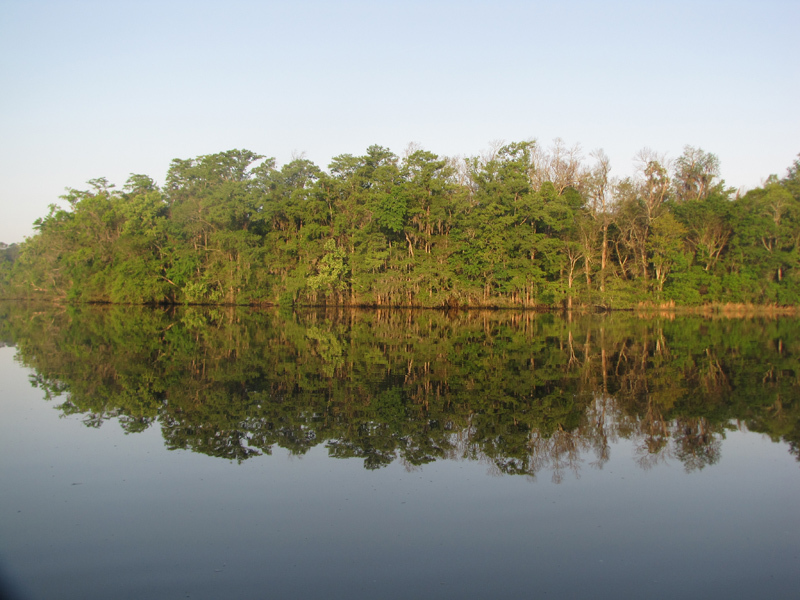 We left the next day to head to Mill Creek in the Reedville area but the bay was so calm we thought we would take advantage and go all the way to the Solomons. It was the calmest we ever saw the mouth of the Potomac which can get quite nasty. We are in our home stomping grounds now and plan to end our 8 month cruise meeting up with our sailing association friends next weekend in Jubb Cove. It has been a wonderful time and we plan to do it again, whether is is next winter or the following, I don't know, but we will be doing it again! This was not a very exciting week but a lucky one. We continued north from Georgetown, SC for a night in the wilderness at Bull Creek in the cypress swamp. 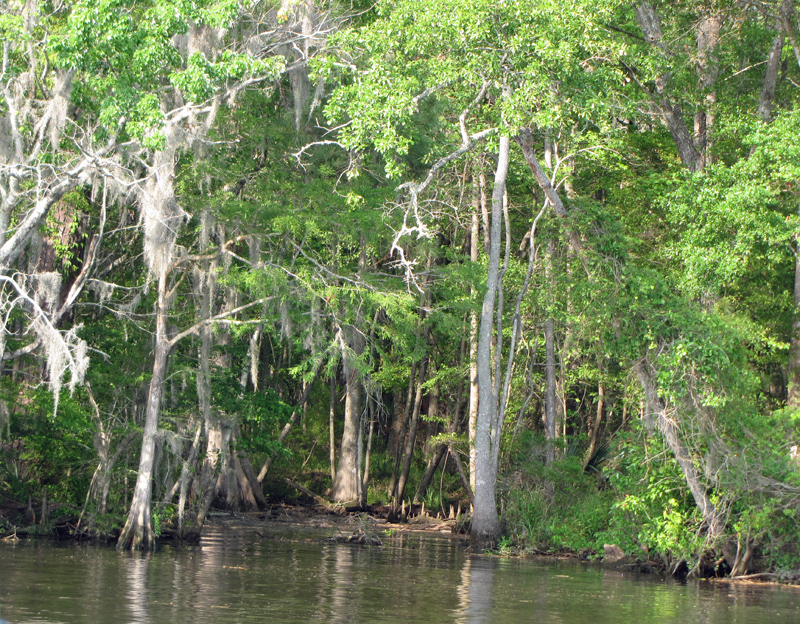 When we got to the anchorage we saw our first alligator in the wild. Unfortunately I did not get a picture because we were in the midst of anchoring. It was a beautiful spot but there were some very strange noises that night as we fell asleep. 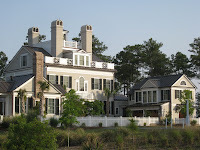 We then headed to Pipeline Canal, Wrightsville Beach and then to Mile Hammock. We had a lay over day in Mile Hammock because of severe storms predicted. We lucked out because they were all around us. The scariest part was for all the tornadoes predicted. I kept thinking where do you go on a boat during a tornado? We got some rain but no wind higher than 26 knots. As I said we really were lucky. 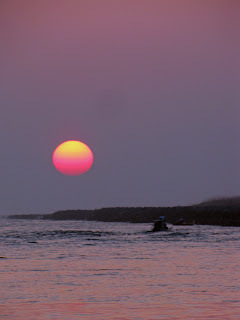 We were also lucky the day we came out of Wrightsville Beach. We got through a 10 am opening at the Figure Eight Bridge and after that it was closed until further notice for unexpected repairs. If we had not gotten through we would had to return to Wrightsville Beach where the winds were 40-45 knots during the storms and blowing right into the anchorage. In Mile Hammock we met up with Bob and Gail on Star whom we met down in Georgetown. We had a delicious meal and a good time catching up on what they had been doing since we last saw them. We had a long day the following day to get to Broad Creek to anchor outside of River Dunes. 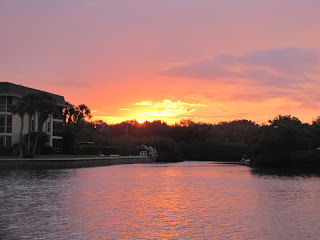 We stayed at River Dunes in the fall and thoroughly enjoyed the amenities. The pool, hot tub, shower rooms, bikes, exercise room and the $1 a load laundry were a delight. So the next morning we went into the marina early. We fueled up and got into our slip by 9am. We used their courtesy car to go to Oriental for the farmer’s market, get propane and then off to the grocery store for supplies. 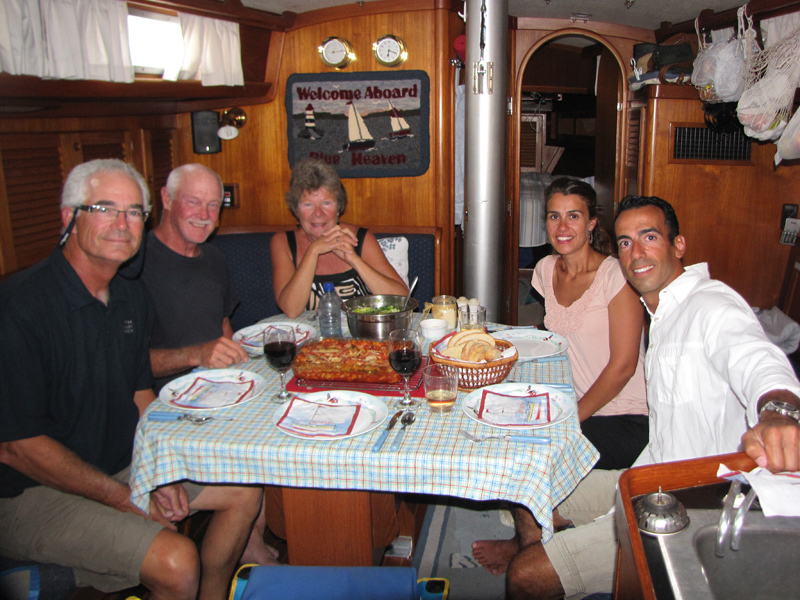 That evening we had dinner with five other sailors who were in the marina. They had a large affair in their main dining room of the marina’s restaurant, which left only so much room for other patrons for dinner, so they put us together. We had a wonderful time getting to know the other people and the meal was delicious. I wanted to stay another day, but Al said we had to keep moving. 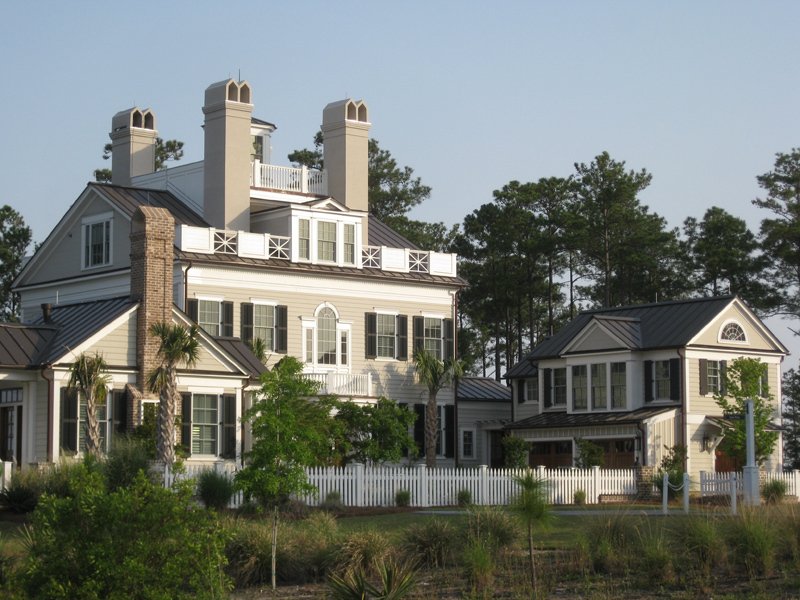 For all you land lubbers, you can visit River Dunes by land as well. They have some very cute cottages you can rent. It is also a whole community, so if you want to buy property I am sure they would love to talk to you! Check out their website. This was one of the larger homes in the community. 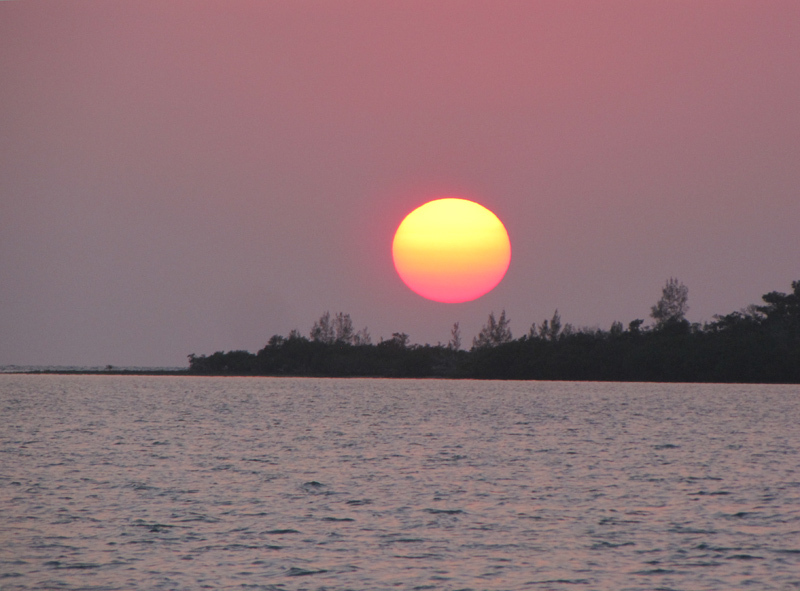 Our days are filled with motoring, sailing or a combination of both heading up the inter-coastal waterway. 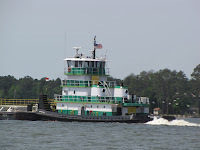 Our scenery has changed quite a bit as we head north, seeing tugs and barges and other commercial happenings. 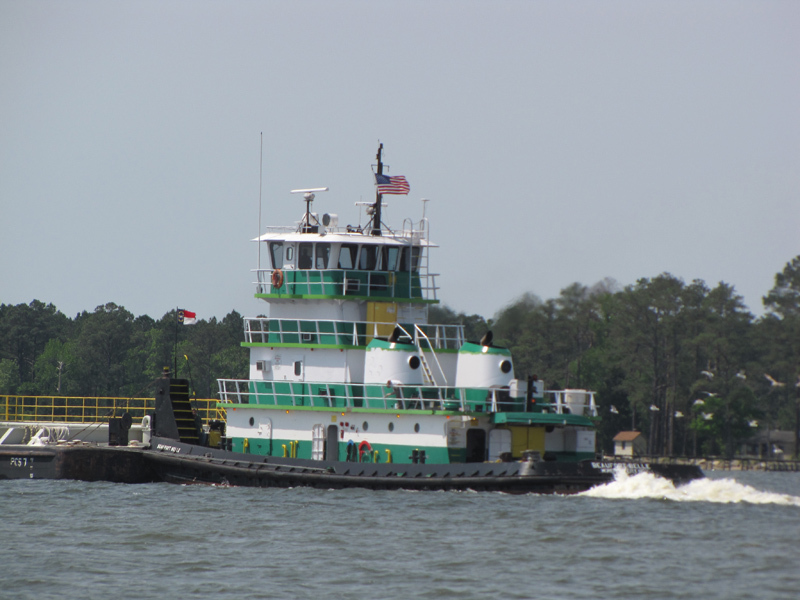 We passed by Bellhaven and anchored at the south end of the Alligator Pungo Canal. I got a lot of rug hooking done while going through this rather boring and least favorite area. Being spring it is a beautiful shade of green along the banks. We came across this Beaver Dam in the canal. You should see the size of the beavers! Only kidding, of course! The Corp of Engineers clean the canal every once in awhile and pile it there. 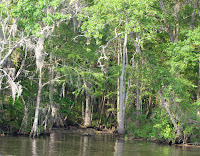 We decided to make it a short day and after a three hour trip through the canal, so we anchored in the south end of the Alligator River. 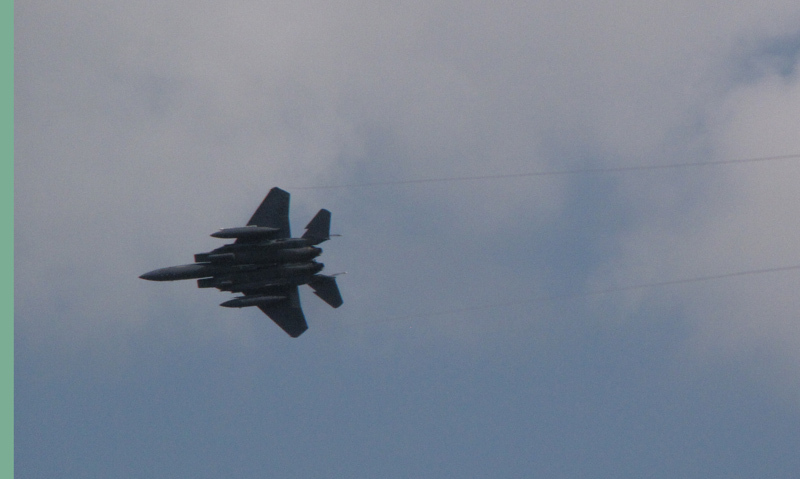 We thought we would have a quiet afternoon but soon found out that one of our armed forces practices flying jets in this remote area. I was glad when five o’clock rolled around so we could have some quiet. However, it was the day Bin Laden was killed so maybe there was a reason to be practicing! We had no ATT cell phone service since being in NC and had no internet service for two days. But we could get TV and Dancing with the Stars! Go figure! 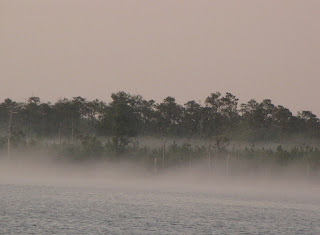 We left early while the mist was on the water to head up to the Virginia Cut and hope to get cell phone and internet back so I can post this blog. We ended up staying four nights in Vero Beach because we heard from Dave and Toni that they would be there Wednesday. Then we stayed an extra day because Al was having the light for the bow that he ordered, sent to St. Augustine Municipal Marina and that it would not get there until Monday, so why leave “Velcro” Beach with free bus service to almost any type of store you want and to the beach as well. We left Friday and had a terrific sail up the inter-coastal waterway which you don’t get too often. We made it to Titusville where we anchored for the night. The next day we did some motor sailing up to Daytona where it blew a good 25 knots for a while but then settled down for the night. We then motored to St. Augustine where I made the 5pm mass at the Basilica of St. Augustine which is a beautiful old church with a lot of history. The next day we went into the dock to fuel up, get water and to hose down the boat. 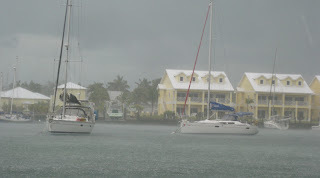 It was the first time we hosed the boat since leaving Nassau in December. 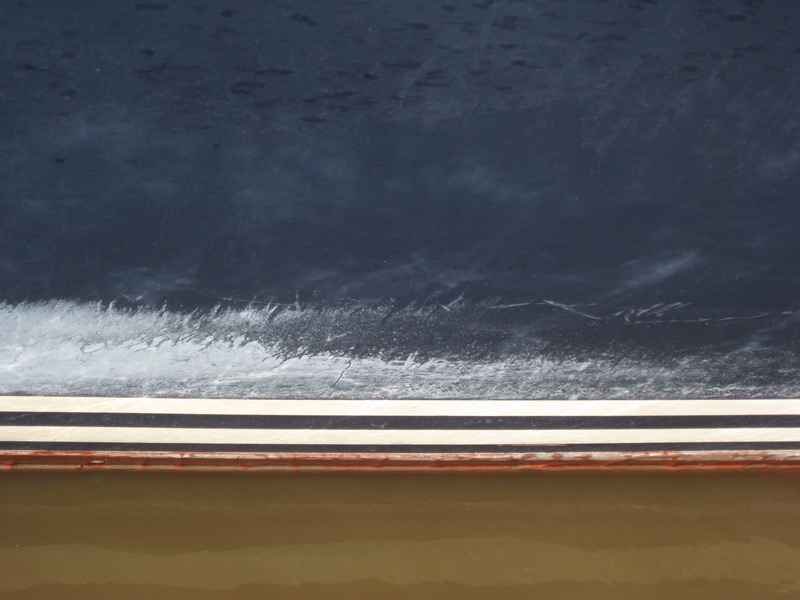 We did have two good rains that helped clean the boat, but nothing is as good as a hose down. 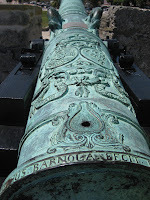 Afterwards we decided to do the tourist thing and go tour the fort, Castillode San Marcos. It was our lucky day because this was the week that all National Parks were open free to the public. 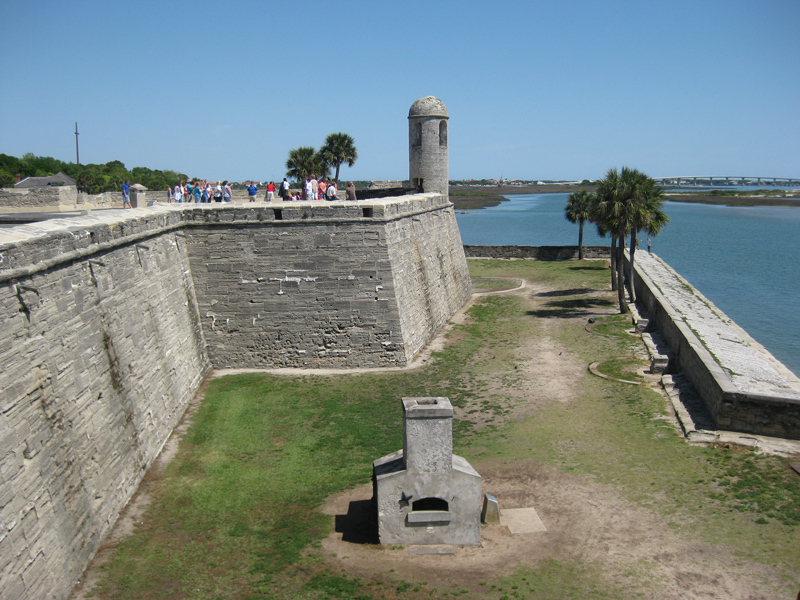 It was interesting to see how they built such a strong fort and how they lived there to defend our country. 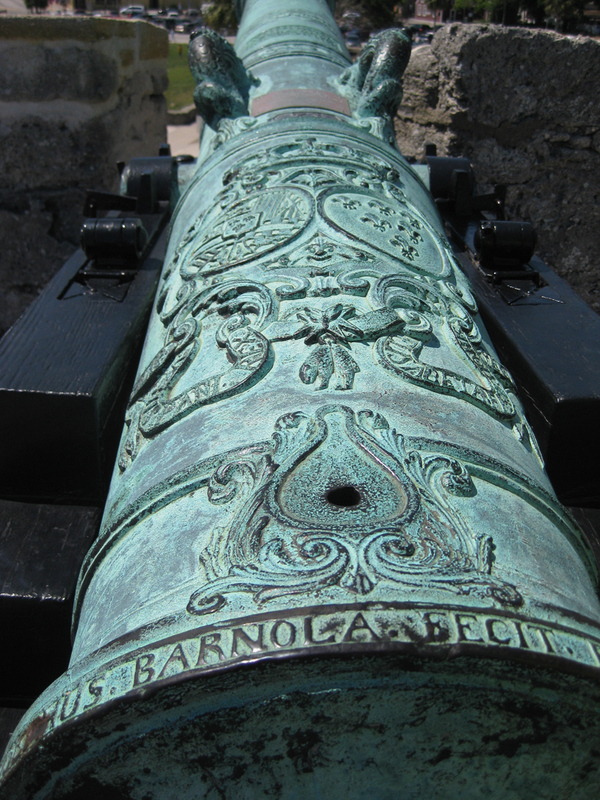 Also I found the decorative touches to the cannons thought provoking. Like why make them fancy? 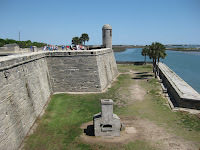 There were some great views from the top of the fort as well. 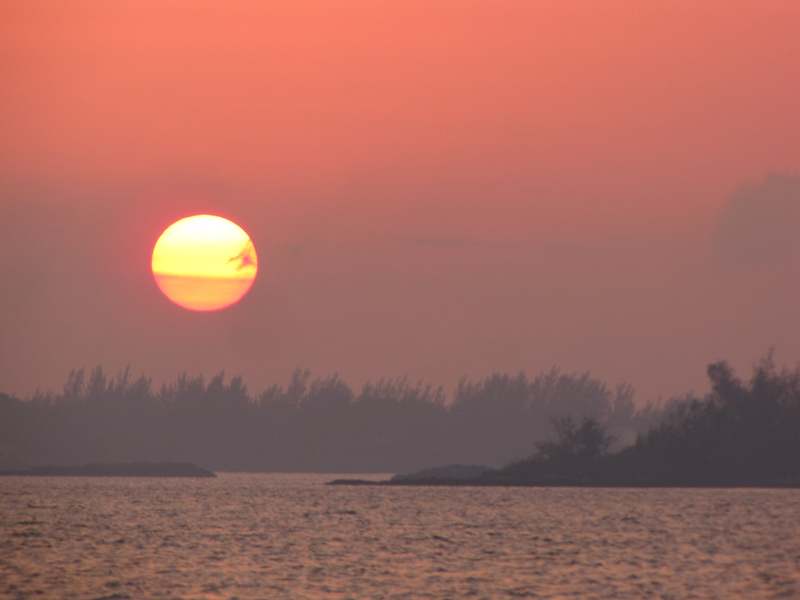 We left at sunrise the next day and got another beautiful sight looking similar to our sunset at Great Sale Cay. Our next destination ended up being Cumberland Island. 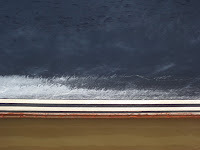 We had been doing some long days because we thought we might like to take a good weather window to go out in the ocean from there to Charleston, thus by-passing the twisting inter-coastal waterway in the buggy marshes of Georgia. That is what we ended up doing after countless hours checking the weather from all the sources we could use, television, internet, and NOAA weather. There was a 20% chance of thundershowers when we neared Charleston but luckily it never happened. 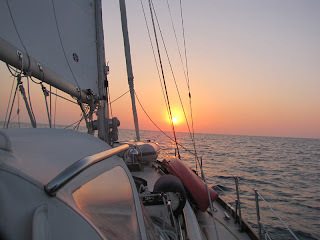 The winds were in the 7-9 knot range from the south, but wasn’t enough to keep us going at 6 knots so we motored sailed. We saw some interesting sights along the way. One area of the ocean was just covered with the round jelly fish with a brown ring. Another area had groups of skates just floating below the surface, almost like they were sunning themselves. But the most fun were the dolphins that came and played next to both sides of the boat around dusk. We never have had so many at once. We saw at least six on one side and four on the other rolling up next to the cockpit. 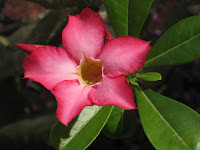 It is so much fun watching them and “trying” to photograph them. It seems all I can ever get are their backs and fins. This was one of my better shots. 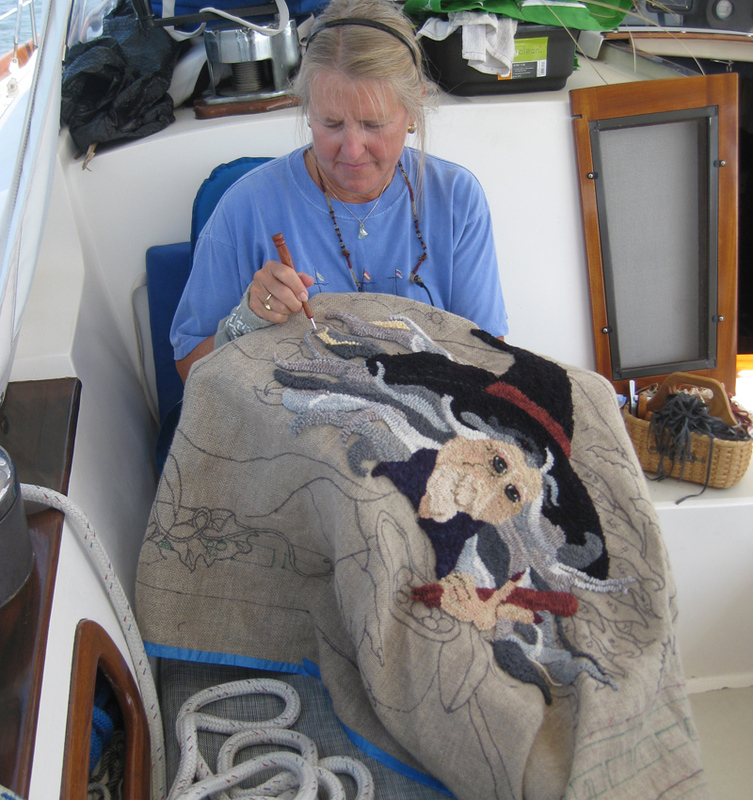 These long days on the ICW and mild sailing in the ocean have given me an opportunity to get some rug hooking done on my Halloween rug. My witch has been a lot of fun to do after the repetitive geometric I completed earlier on this trip. We made it into Charleston inlet around 8:30 in the morning and headed to Isle of Palm marina to visit with some friends. Al slept to mid afternoon since he was up almost all night, while our friends took me to replenish produce and milk. The predicted thunder storm did finally arrive but while we were having dinner with our friends safe in their home! We had a pleasant visit with our past neighbors and moved out the next day to continue our trek north. We motored from Isle of Palm and spent 6 hours in the ICW in rain, with the radar swinging, and the six mile band of showers followed us the whole time. The only change was regular rain, or downpour! We are in Georgetown, SC to enjoy the town and attend church on Easter. 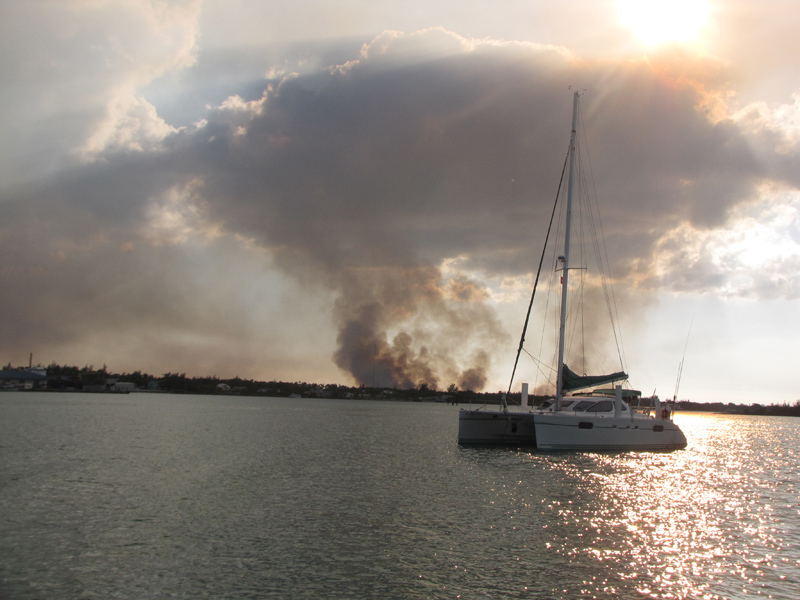 We could not wait to leave Marsh Harbor because of the smoke from the fires so we visited Man of War Cay next. We did the usual walking to the beach and the settlement to check out the few stores. It was Sunday so nothing is open generally in most settlements on the various cays but I determined that I wanted to come back the next day to check out the store that has the renowned Andros batik fabric. 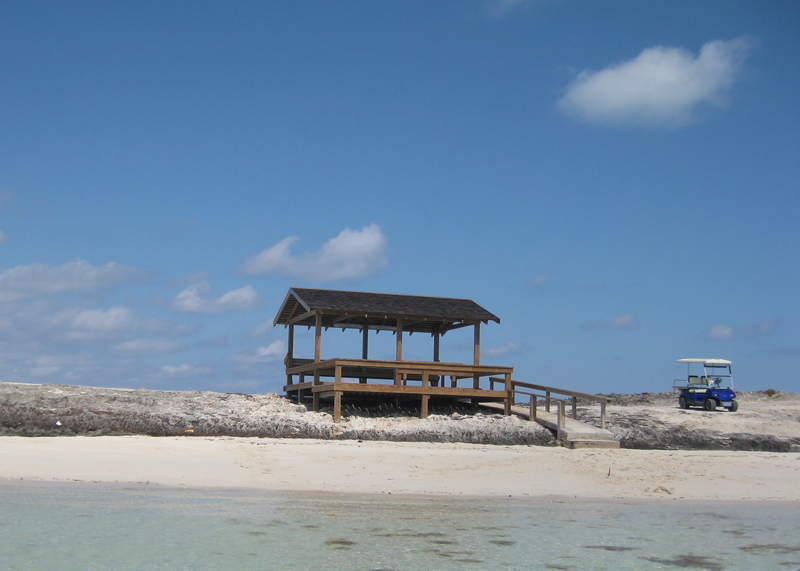 Several boats we knew were anchored out with us at the narrowest part of the cay where there was a pavilion with picnic tables. We decided to stage a Happy Hour gathering there which was lovely and a fun way to gather so many people to share stores and plans for the future. 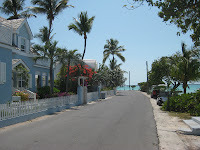 After a quick trip to the fabric store, we headed across to Treasure Cay Resort area. Some nasty storms were predicted for Tuesday so we wanted to be in a protected area. The harbor here has 360 degree protection, so well worth the ten dollars a night to anchor there. 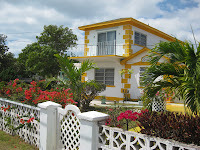 You also had use of their pool, showers, beautiful beach and internet. 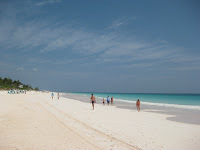 We checked out the beach, and I can understand why it is considered one of the top ten in the world. Just gorgeous! We got the lay of the resort and were ready to enjoy for the rest of our stay. The next day we enjoyed the beach and had lunch with Sandra, Chuck and Freckles at the Beach Bar. 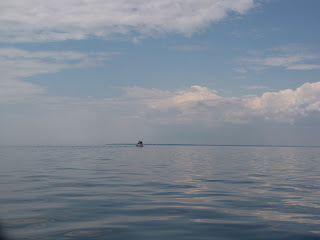 It was so beautiful that you say to yourself, “How can we leave these beautiful waters?” knowing that in another week we will be back to dark green or muddy waters of the inter-coastal and eventually to the Chesapeake Bay. I am not sure I can swim in the Chesapeake ever again! We enjoyed our first land showers since December and then headed back to the boat for the skies darken and we had to prepare for the storms. The rains and wind came but we only saw 26 knots at the most, while our friends back in Marsh Harbor had 53 knot sustained winds for about 15 minutes! When it was over, the air was much cooler with no humidity which was a welcome treat. Being cloudy and cooler we took advantage to walk the grounds, pick up some groceries and I did some baking in the afternoon. Sandra and Chuck invited us for dinner which was a welcome treat. Before leaving the next day we fueled up and paid to fill our tanks with water. 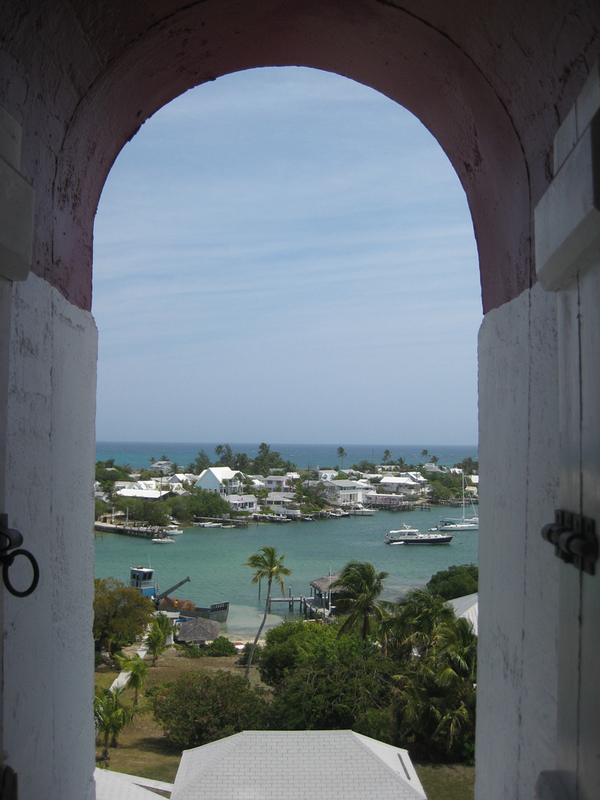 For us, it was the first time we paid for water since we left Nassau in December. Most of the time it is 20 cents a gallon, but this was a flat fee of $9 for boats 40-50 ft. One of the reasons people like Georgetown is because of free water being available and we took advantage of it. We also found free water in about two other places. 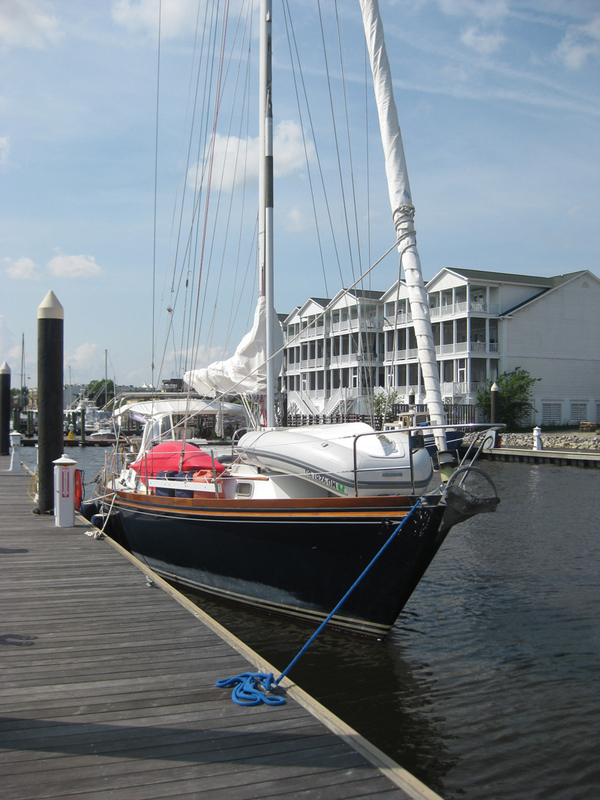 We sailed to Green Turtle and picked up a mooring in Black Sound. We once again went to check out the settlement of New Plymouth which was a bit larger than Hopetown or the settlement at Man of War. It had many quaint small houses and businesses. We also sped over to White Sound to see what it is all about. It is mainly two resorts, restaurants and marinas that people enjoy there however we did not have time to try them. The next day after exploring the beach which wasn’t much after seeing Treasure Cay Beach, we decided to anchor outside of New Plymouth because there was no wind or bad weather predicted. When we went into New Plymouth to get a few things, we met up with Pam and Glen on Blue Pearl and their guest as well as Chuck and Sandra on Eliora. So we decided to go to Happy Hour at Pineapples after everyone was finished with their shopping. Wow! Powerful rum punches which made for a very happy hour! 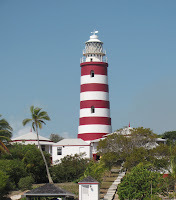 But it also was sad because we also had to say our goodbyes because we were heading out to Great Sale Cay to prepare to cross to Florida and they weren’t leaving until later in the week. 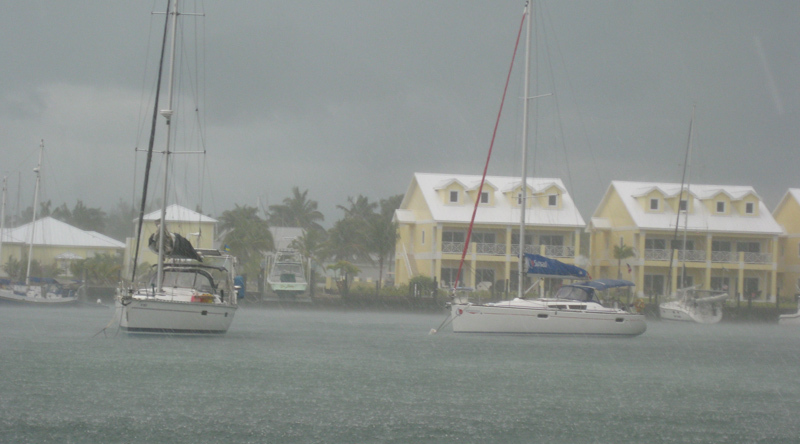 As often is, the wind was right on our nose so we motored most of the way to Great Sale Cay. We only got about a twenty minute sail at the end of the trip. There were about ten boats in there mostly staging to cross to the USA. We heard another two boats that had the same plan as us to go to Fort Pierce inlet. 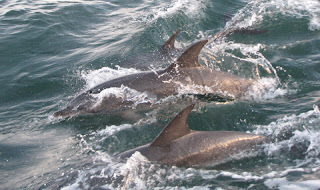 So Al called them on the VHF and asked if they minded if we tagged along. They were the usual friendly cruisers on boats called Oz and Star of the Sea, and said that it would be great to have us. So our departure time was set for 3pm the next day, which was Sunday.We experienced the last beautiful sunset in the Bahamas with Al blowing his conk horn as it went down. About quarter to three we started out engines, except that Oz’s would not start. We waited hoping he could get the starter to work but was not being successful. So we put our dinghy in and Al rowed over to be of assistance. After about 30 minutes the engine was started by hot wiring it, and we were all off. The light winds were out of the northwest not the southwest, as predicted, so once again it was a total motor trip. The nice part was, there were very little or no waves. The Gulf Stream was calm. It ended up being a easy trip which is what we want for a crossing. 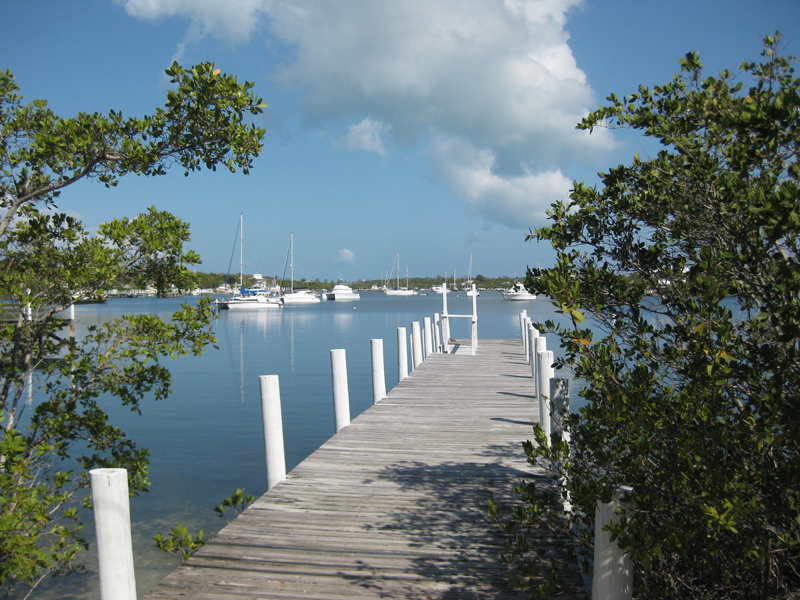 We reached the Fort Pierce inlet around 11am at slack tide which is exactly what we wanted. Then on to Vero Beach for a night or two and restocking in an American grocery store. Woohoo! We left Meek’s Patch anchorage across from Spanish Wells around 6:45am to make our passage to the Abacos. We had a great sail to the cut but once through it was mostly a downwind sail. 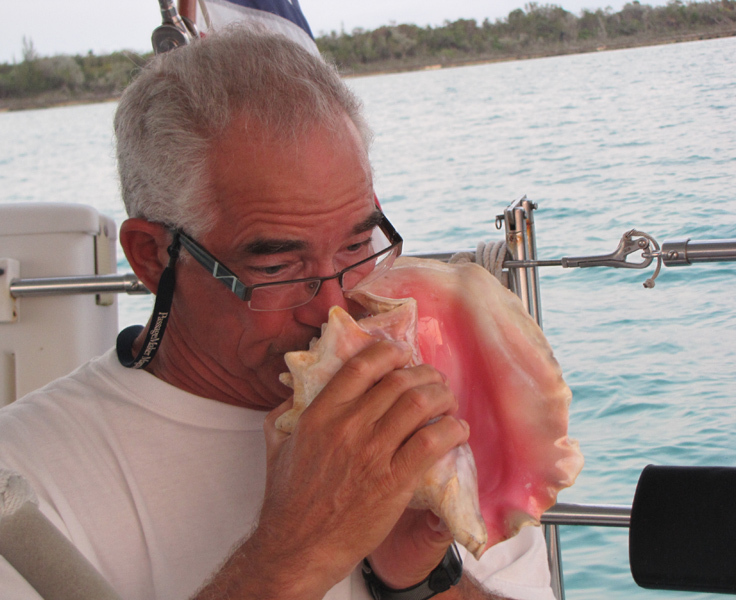 We sailed several hours but then put the motor on for the last few hours anchoring off Lynyard Cay around 5pm. It was a loooo…ng day! 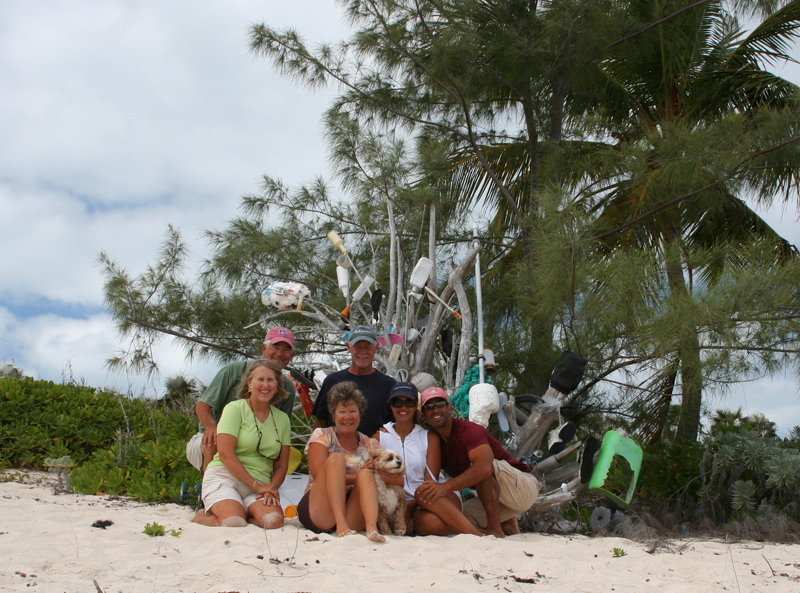 After listening to the Abaco Cruiser’s net which tells you all sorts of information we took the dinghy ashore to a pretty beach on Lynyard Cay. Once again on the ocean side we had great sea glass pickings which was a lot of fun. Marilyn on Discovery, Sandra and Chuck on Eliora, Mary Lou on Cygnus and myself all came back with a stash of glass. Pete's Pub "Where the elite eat in their barefeet." Afterward we headed across by dinghy into Little Harbor to lunch at Pete’s Pub and to see the Pete Johnston gallery of sculptures. Unfortunately, they were not having a pouring at the foundry until Thursday and it was only Monday. We now understand why people say you have to go to Pete’s Pub because it was a great eating experience! It was the best fish of the entire trip so far. 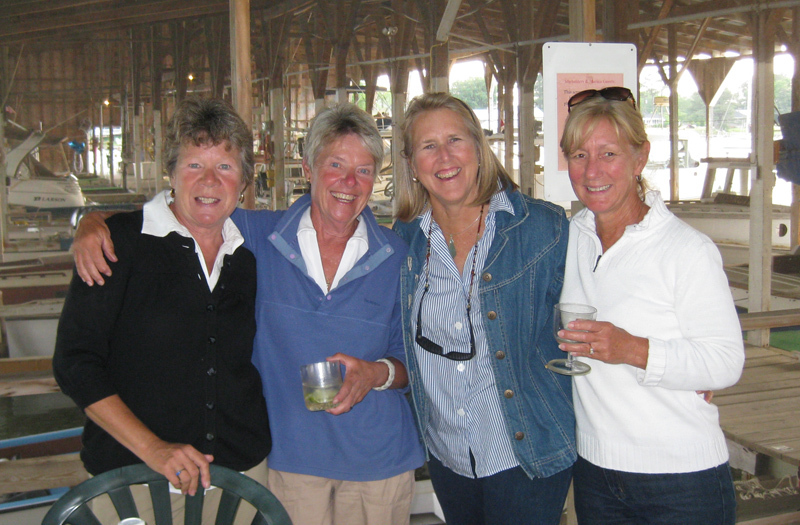 The next stop we made was Marsh Harbor after a vigorous sail. The harbor was very crowded with so many cruisers starting to head back. We saw at least six or seven boats in the harbor whom we had met along the way or down in Georgetown and it was fun to reconnect with them. It was a place to get the chores such as laundry and food shopping done. The food store was a mega store which was a bit overwhelming after all the little stores we had been shopping this winter. We found an internet cafe which is how we got the last blog out. Our bullet isn’t working well for us so we are not getting connected out on the boat. There were a few more shops here to so I got my “shopping fix” somewhat filled. Unfortunately they were having fires on the island. They called them forest fires but since they have no forest I would think they were brush fires. Unless they are threatening homes they do nothing. 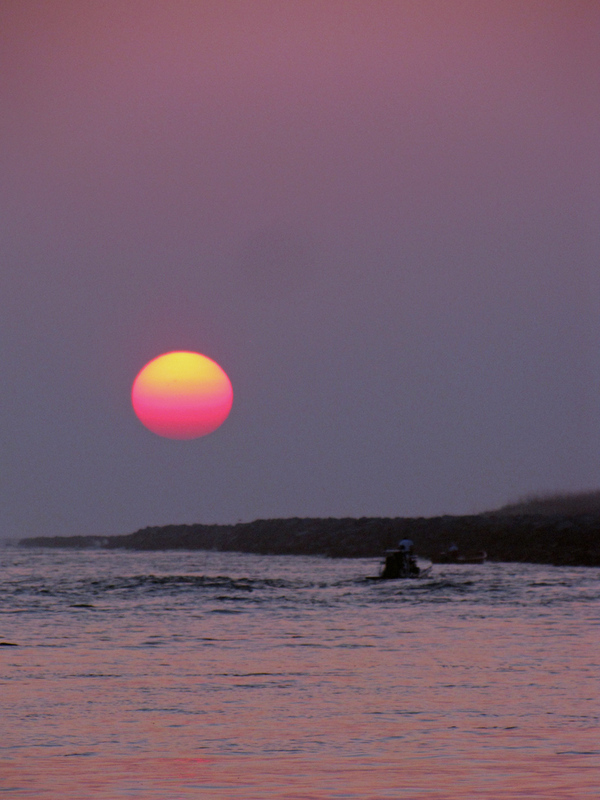 So it was a bit smoky and made for an interesting sunset,but not pleasant sleeping. 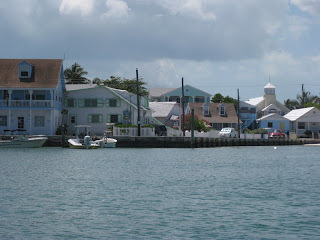 After two days in Marsh Harbor we decided to sail over to Hope Town on Elbow Cay. There is no anchoring in the harbor and we got one of the last two moorings available. Now here is a quaint little town! 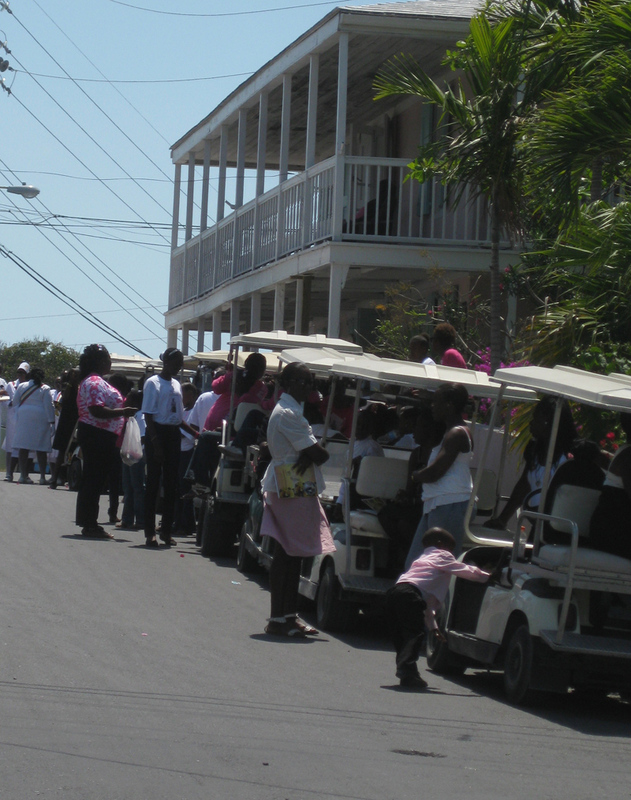 The streets are barely wide enough for a vehicle and most use golf carts. 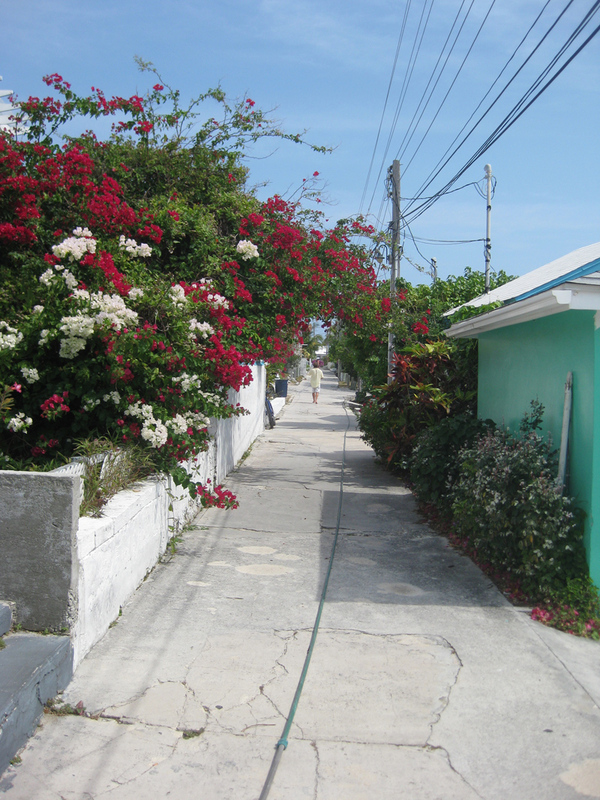 The little cottage type homes with the beautiful flowering bushes were just lovely and they had a very nice beach as well. We met up with Chuck and Sandra from Eliora and they told us about the wonderful coffee shop with great mango sorbet. It was superb! And while we ate, their dog, Freckles, entertained us with his tricks. The town had the typical gift shops, ice cream store, coffee shop and various restaurants that most tourist towns have but not in excess. It was a true delight. Our friends, Bill and Marge on Jubilant were there so we shared another happy hour and the following day we went to dinner together. Earlier that day we had a front come through with a downpour. Before I could get all the hatches and ports closed, we had some went bedding and wet computer but luckily all dried out. It was one of the few rain showers we had so we took advantage and really cleaned the boat of dirt and salt. When you have not been into a marina since December it is hard to clean the outside. 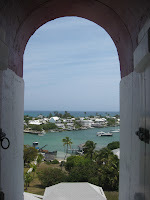 We climbed all 101 steps of the lovely lighthouse there and had some great views of the harbor and the waters. I really liked this stop except for the close moorings. We decided to go meet up with Eliora and Discovery back in Marsh Harbor to be able to celebrate Al’s birthday with friends. 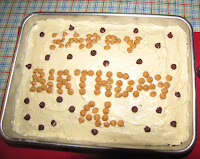 So we had Marilyn and Carl, and Chuck and Sandra over for dinner and chocolate cake which I made and decorated with peanut butter and chocolate chips. 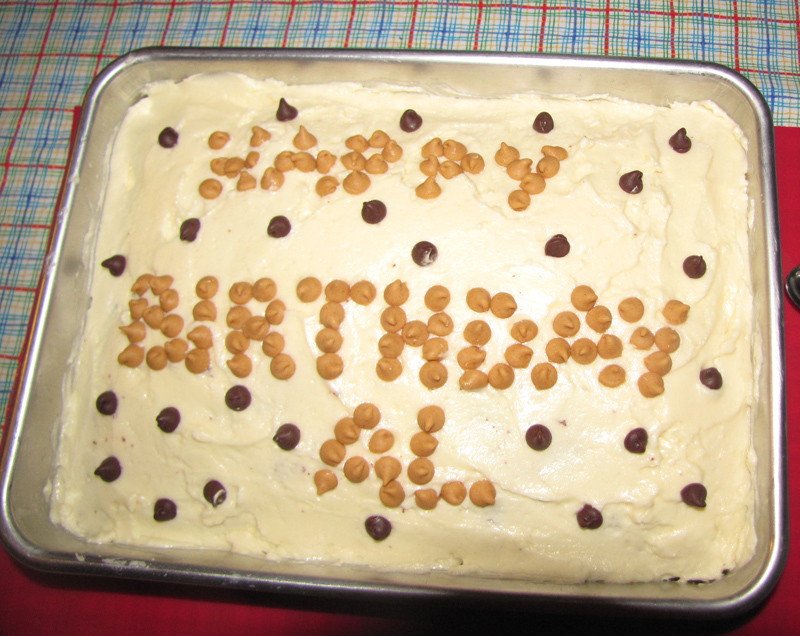 Another year older and another year wiser! We left Rock Sound on Eleutheura to sail about 20 miles north to South Palmetto. 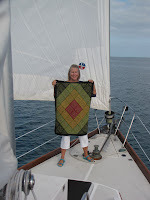 We had an enjoyable sail but had a hassle anchoring. We put it down and pulled it up four times until we were satisfied that it was dug in. It was the first time that we had problem setting the Rocna anchor but less problems than the other boats with different anchors. The bottom looked like sand but was rather hard with little loose sand. We wanted it to be set because strong winds were predicted while we planned to be here. 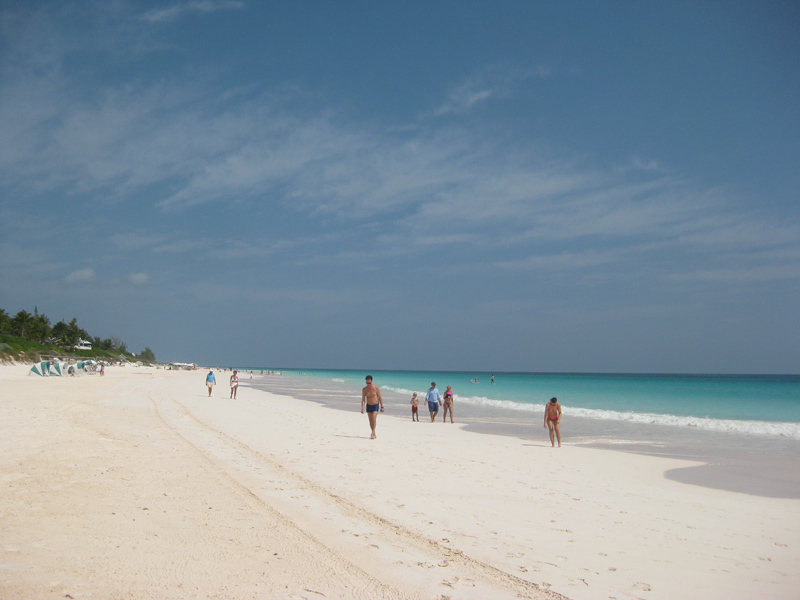 We walked across to the ocean side to a gorgeous beach. 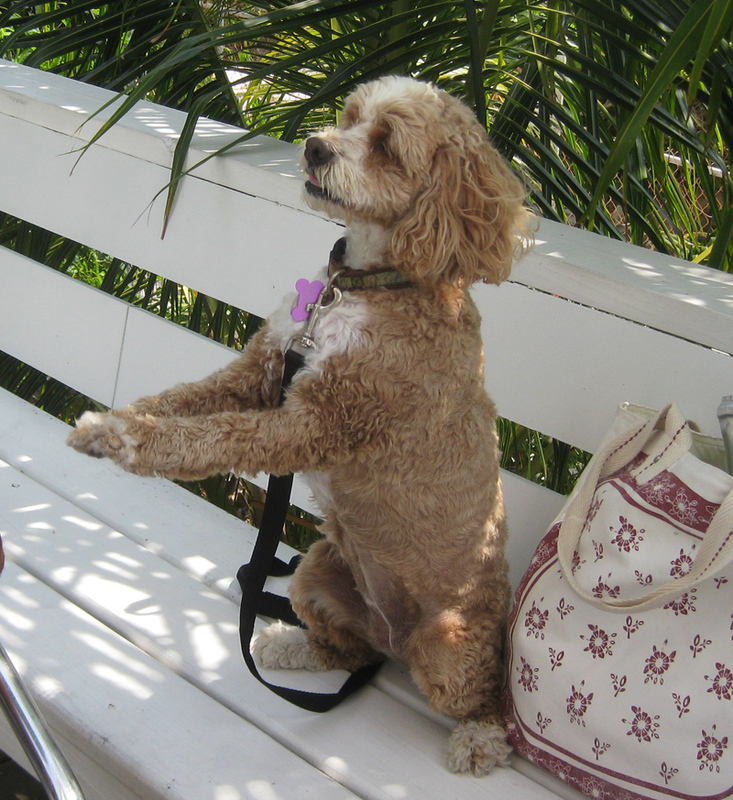 Carl, Marilyn, Al and I met Chuck, Sondra and their cockapoo, Freckles, there for a long walk on a gorgeous beach. They had an interesting way of keeping the beach clean. They made artwork out of the flotsam by hanging it the dead trees. Very interesting! On the way back we saw some cute homes. Later everyone came to Blue Heaven for dinner and a game of Mexican Train Dominoes. The winds came as predicted but we were able to get into land for a long walk the next day. However, for most of the day we just hung out on the boat. We were thankful that the anchor held in the consistent 20 knots. 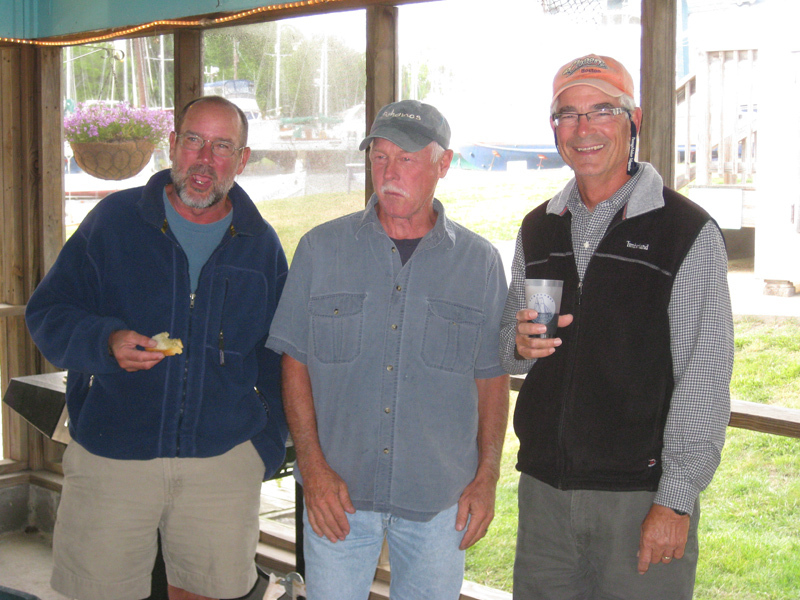 We moved the next day all of 5 miles to Governor’s Harbor on Eleutheura. It was a very gentle sail so I was able to finish the edging on my rug. Al actually took a picture of me with the rug while we were sailing. Once again anchoring was a problem in the harbor for the other two boats but we found patch of sand and I told Al to drop it in the light blue spot. It held the second time we put it there. Eliora got so frustrated after numerous tries that they went around the bend to another beach. We walked the town which had more than the other settlements we had been to lately. There were two decent grocery stores, dive shop, clothing store, and two wine and spirit stores. 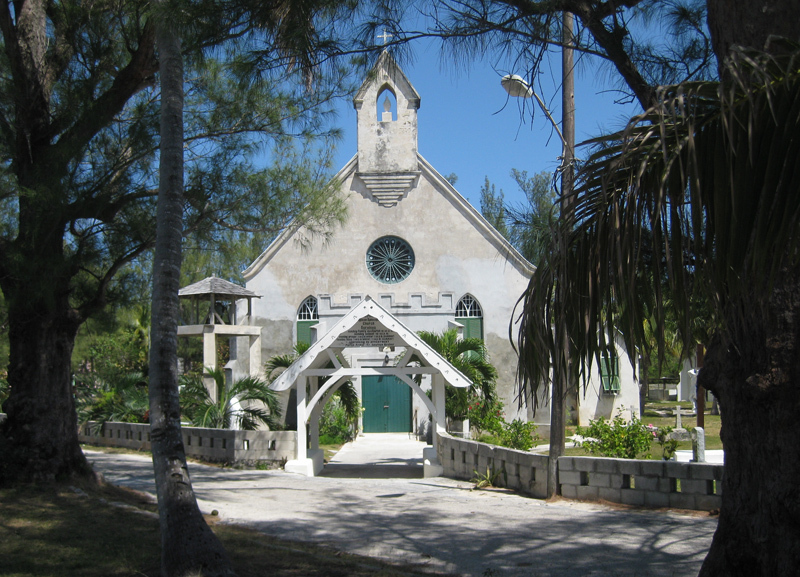 The library and Anglican Church were two interesting buildings along the waterfront. 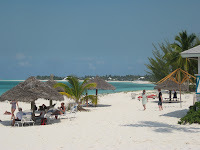 The next move was to Alabaster Bay which basically was a beach area with Cocodimama Resort. I got some kayaking done around the bay and later we enjoyed a drink in the resort. They had a wonderful sitting area with sofas. What a pleasure to sit on a sofa! We have not been on one since when we were home at Thanksgiving. Oh, such simple pleasures! Then we went to Discovery for a shared delicious dinner. You can see we are not starving! We finally had a longer day to get to the northern end of Eleutheura (a 110 mi. island) which was a brisk sail of 33 miles. We wanted to go through Current Cut at slack tide but got there about an hour sooner than we expected due to stronger winds than expected. We got through it fighting about 2 knots of current, but it wasn’t too bad. 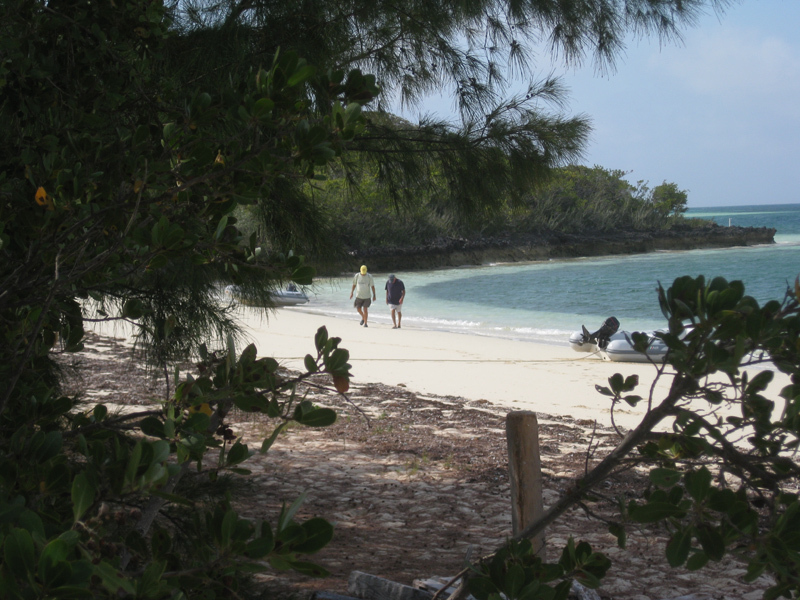 What did surprise us was to see snorkelers in the cut. Since the winds were light and out of the west we anchored at Meek’s Patch which is about 2 miles across from Spanish Wells. Another boat, Tilt, joined us once again. We all took our dinghies across to walk the settlement of Spanish Wells. 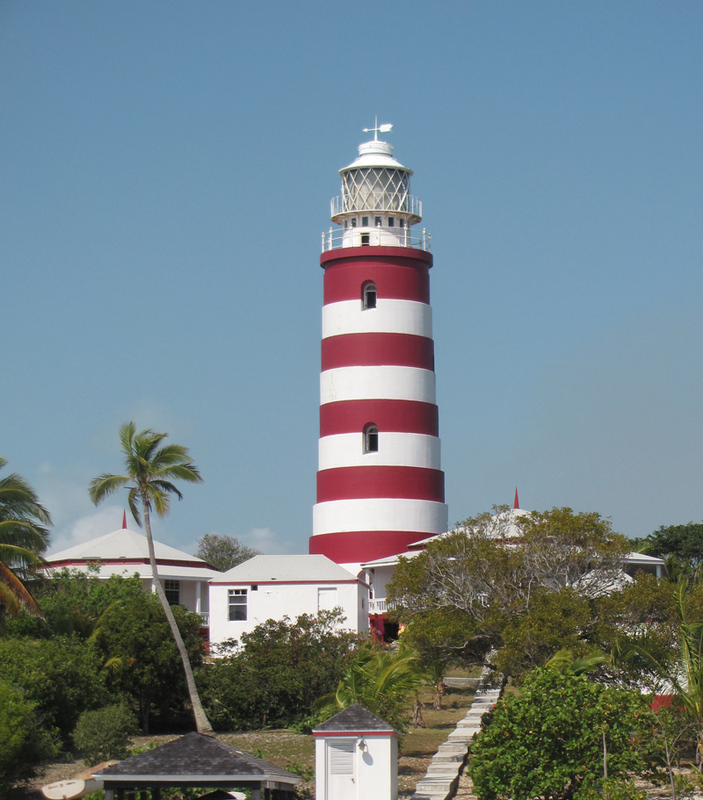 This settlement is a more prosperous than many of the places in the Exumas and other islands. It had the first large grocery like we see in the USA. 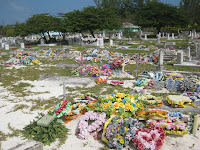 The cemetery was a sight to see with all the flowers! Some lovely homes and numerous stores are here but not much choice for restaurants. I will say I have not been impressed with Bahamian cuisine. It is mostly hamburgers, chicken or ribs or fried conch, fish or chicken fingers. I like fish, but not fried and not with the heads! Out of the group of boats, Al and I were the only ones who had not been to Harbor Island, so we went by fast ferry for the day. 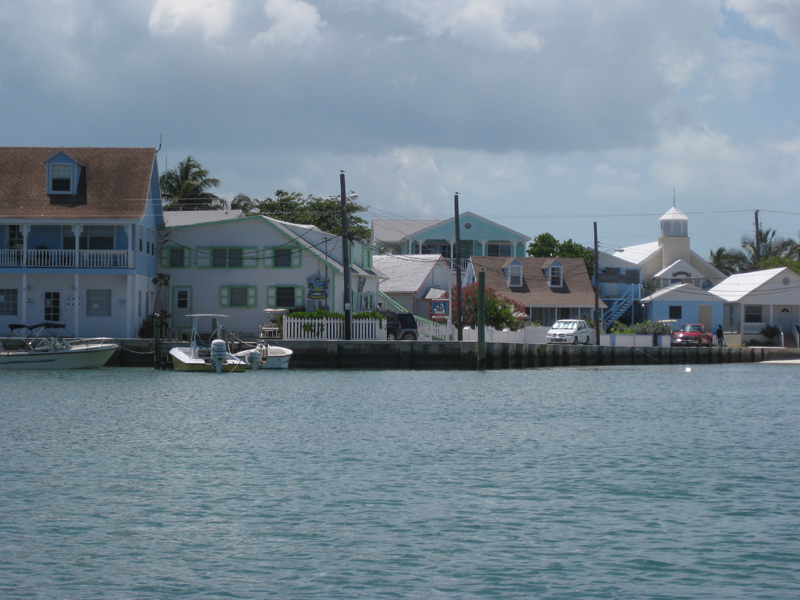 This is even a wealthier island with lots of well-to-do visitors. The homes and prices for food or clothing were definitely catering to the wealthy. 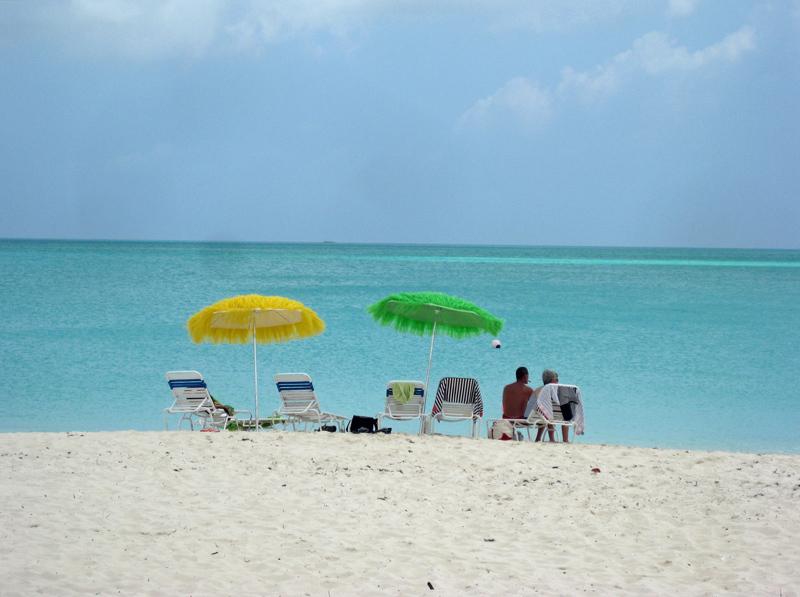 When we got off the ferry, we noticed many Bahamians dressed to impress. We thought that there must be a wedding. We walked past the Anglican Church which had canopy and chairs outside and lots of people milling around. 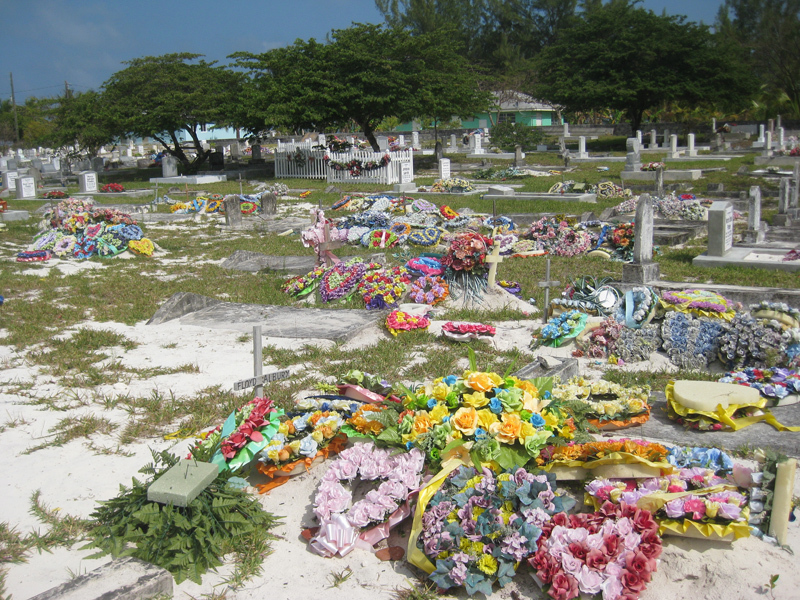 After a walk to the “Pink Beach” and lunch at a lovely spot overlooking the ocean, we came by the church and services were still going on. We asked one of the many waiting in the golf carts what was going on, and it was not a wedding but a funeral. We were told the preacher had not spoken yet (at least 30 to 45 min.) and then there would be a parade afterwards to the food and beverage to celebrate this woman’s life. It looked like around two hundred people were there! On these small islands, I guess everyone knows each other or are related. 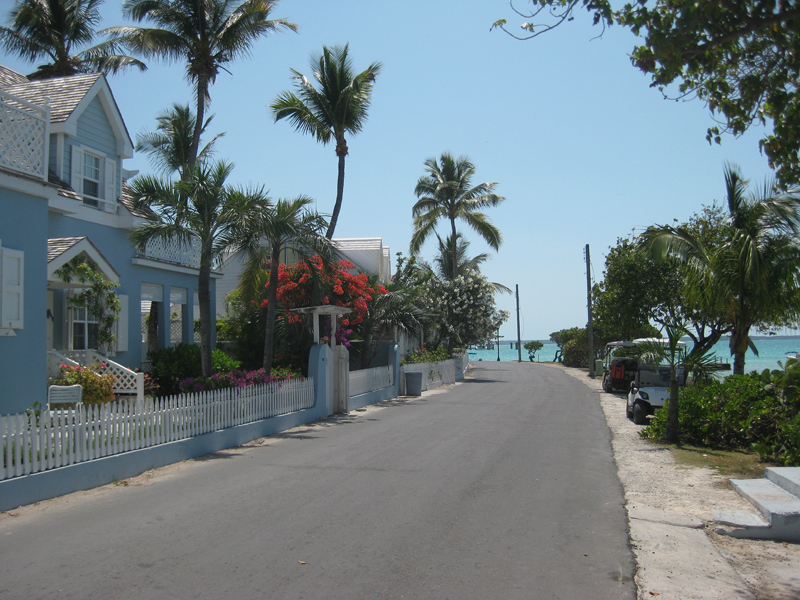 The island had some very attractive homes and streets than other places we visited. Going to and from Harbor Island the ferry had to go what they call the “Devils Backbone.” It is an area with many reefs and even the ferry had to zigzag through the maze. You can see why they recommend that you hire a pilot to take you through on your own boat. The day was a nice change of pace. 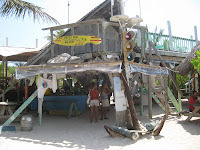 We are off in the morning to head north to the Abacos planning to be around Little Harbor. It is a 50 some mile trip so we will be up and out early.